Of all metals, copper is the most effective for cooking. It's the best metallic conductor, apart from silver. The temperature spreads evenly on all sides of the cookware. Your sauces will no longer burn or separate. Melting chocolate will become child's play. Perfect accumulation of heat. Your delicious stews can simmer for hours. A red copper pan is a "green pan". Ideal conduction and optimal heataccumulation will allow you to save a lot of energy. This will make a significant difference on your energy bill. Associated with gastronomy for many generations. Copper stands for class and perfection. Timeless style that fits perfectly with any kitchen interior. Falk Culinair is a company that specialises in manufacturing professional-grade cookware of outstanding quality. Falk Culinair developed a special bimetal copper that has been introduced to the market. A thick plate of copper is coated with a very thin layer of stainless steel under extremely high pressure to produce a high-quality product. The cookware maintains all the conductivity advantages of copper while the outer layer of stainless steel gives the product a sleek, modern, and durable exterior. Falk Culinair cookware and utensils are guaranteed for life when used properly. Proportions, shapes and rounding of lip were all designed in collaboration with Professional Chefs. All models have lips and can be used on conventional stoves. Handles are ergonomically-designed and made from indestructible cast iron. All models have an exterior brushed finishing. 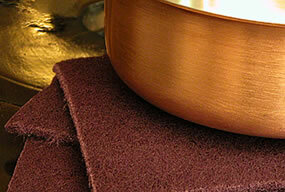 This satin finishing is easily maintained with a very fine sponge (Scotch Brite® for example). The interior stainless steel layer will resist abrasion or oxidation, ensuring that the pan stays permanently clean and hygienic. What value am I getting for the price? The value of bimetal copper is significantly higher than iron or stainless steel. 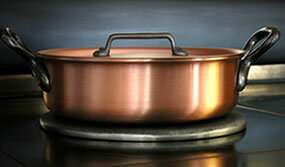 In addition, all models are manufactured in copper (2,5mm) unlike other manufacturers of coppered cookware. The price of our cookware is mainly influenced by the LME copper index. This index has had explosive growth over the past few years. Despite the very high value on this index, Falk Culinair's cookware and utensils remain affordable for both professional and home chefs. A purchase of bimetal copper cookware by Falk Culinair is an investment with great value for your money. Based on our lifetime guarantee and energy savings, our cookware is an excellent value while bringing professional quality and cooking comfort into your kitchen. The bimetal range of cookware is best-used on gas or electric stoves. However, if you use an induction stove, an iron plate is required.